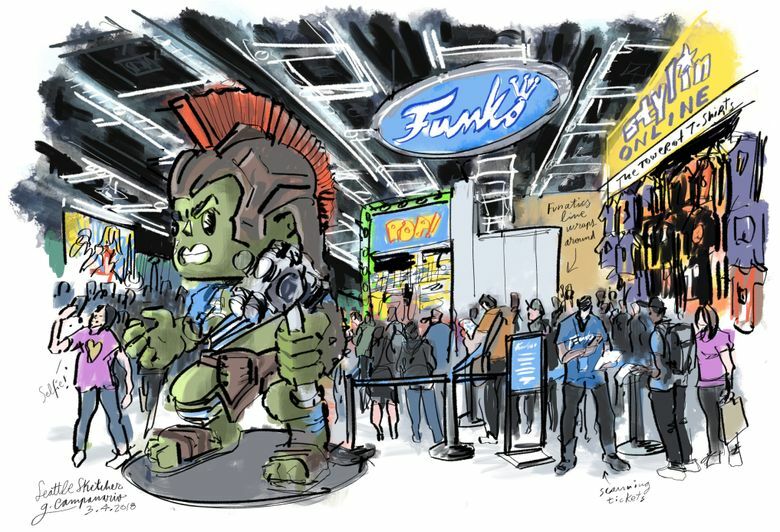 Did you go to Emerald City Comic Con last weekend? I was there on Sunday with my teenage son, and if you’ve been following my posts, you already know why our first stop was the Funko booth. The folks at the Everett-based purveyor of pop-culture figures know how to create demand. Each “Pop!” costs around $15, but some of the most popular can sell for hundreds of dollars online. That’s the case with the Comic Con limited-edition exclusives that were for sale at the Washington State Convention Center in Seattle on Sunday. We managed to purchase a handful before they sold out: Big Foot, Yondu, Baseball Freddy Funko and Green Chrome Batman. But it wasn’t just timing — there was luck, too. We first had to enter an online lottery to win a ticket that gave us the chance just to stand in line. Afterward, a fellow funatic roaming around offered $200 cash to buy the Green Chrome Batman from us. I was shocked, but my son explained. Chrome Batman figures are especially popular, he said, and figures from this limited edition of 1,500 were already being sold online for prices ranging from $400 to $500. Isn’t that crazy? Of course, there’s much more to Comic Con than Funko: The artist alley where you can meet creators and get autographed prints and originals, the comic-book dealers selling vintage zines, the stations where you can play new board games, the panels with experts and celebrities from the entertainment industry, and let’s not forget all the fans in costume impersonating their favorite pop-culture heroes. Since I was there as a parent this time, I didn’t have the chance to capture that scene in full, but I’ve already told my editor that I plan to return next year. And I have a role to play: the Seattle Sketcher!